We landed after thirty-plus hours in transit. Jostling carry-on bags and excitement, we made it to the bottom of the stairs, stepping foot into the tarmac in the pitch dark. No lights anywhere. The terminal ahead stood black against the night sky. I scurried across the tarmac, herding my children like chicks, until we reached the threshold and the arms of my awaiting husband. Airport workers and travelers alike were armed with cell phones, not flash lights. To the glow of iPhones, passports got stamped and luggage was claimed. It was an odd kind of carnival as we recognized friends by small, soft circles of light and greeted in shared darkness. It seemed only our laughter punctuated the molasses air, thick with humidity. We drove away from the airport, finally having the high beams of the car. We moved toward the lights of the city, twinkling ahead and beckoning us home. It would take the crew nearly two hours to get the electricity up and running back at the airport, stranding a jetliner and passengers eager to fly elsewhere. That’s how darkness works, sometimes. 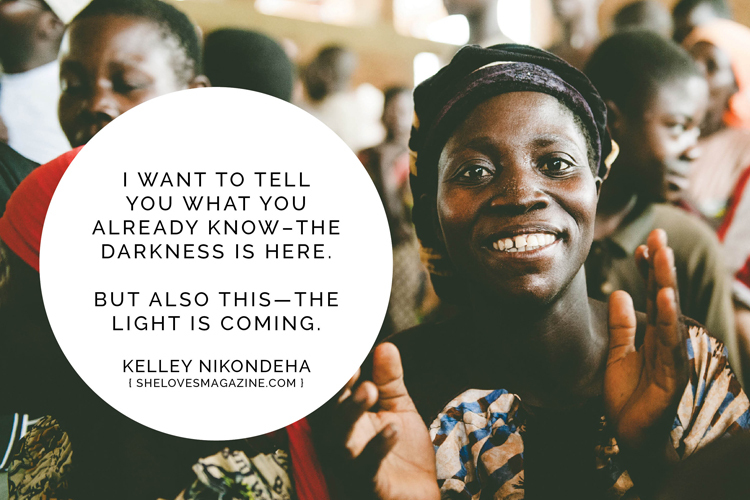 Read the rest over at SheLoves Magazine.